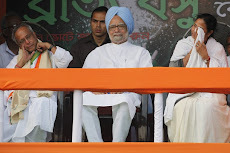 Kolkata, 30 April : Senior Congress leader Pranab Mukherjee today ridiculed the demand for a judicial inquiry by West Bengal Chief Minister Buddhadeb Bhattacharjee and his party into the "political conspiracy" behind the arms drop in Purulia 16 years ago. In an obvious reference to the Purulia arms drop case accused Kim Davy, Pranab Mukherjee, the union finance minster, said, "An accused is levelling allegation and a hue and cry is being raised on that basis. Judical inquiry is demanded. Were they sleeping all these years?" 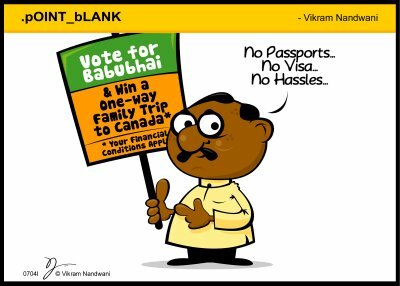 he told reporters here before leaving for campaigning in Midnapore. Noting that CBI had investigated the case and submitted its report, he said that the incident had taken place on the midnight of 17-18 December, 1995 and after that there was a non-Congress government in Delhi for eight years. 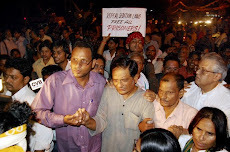 "Indrajit Gupta of CPI, who hailed from Bengal was union home minister for two years. L K Advani was union home minister for six years. Three (assembly) elections were held in West Bengal since then. This allegation was never raised," he said. In a statement yesterday, Buddhadeb Bhattacharjee said that a political conspiracy had been exposed in the media behind the arms drop 16 years ago and demanded a judicial probe. UNB, Dhaka, 30 April : Bangladesh government on Saturday made public the much-talked about probe report on recent share market scam. 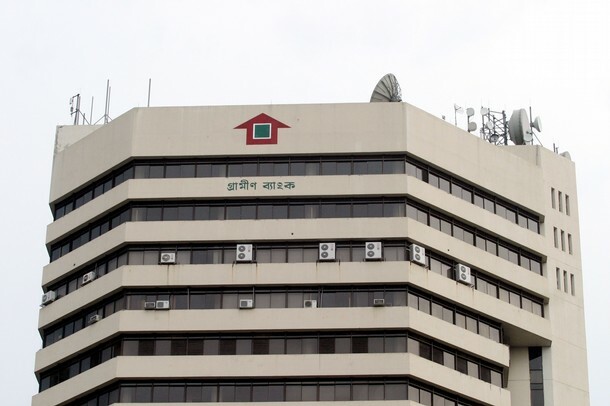 The probe-report, containing 143 pages, was uploaded on the official website of the Ministry of Finance (<http://www.mof.gov.bd>) at about 6 pm today. Meanwhile, the Finance Minister held a press conference at the Secretariat in the evening detailing the next course of action from the government side to stabilize the capital market. PTI, Itanagar, 30 April : Arunachal Pradesh Chief Minister Dorjee Khandu, whose helicopter was feared missing after take off from Tawang, is safe after the chopper made an emergency landing in a place in Bhutan. Chief Minister's office said that Khandu's helicopter had to make an emergency landing due to technical snag near Tawang but inside Bhutanese territory. Two other passengers accompanying the Chief Minister and two crew members of the Pawan Hans Eurocopter B3 craft are also safe, the CM's office said. 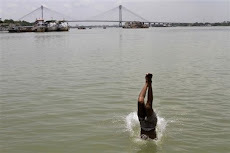 Defence sources in Kolkata said the helicopter landed in Daporijo. The other passengers are Lamu, a woman relative of the Chief Minister, his security officer Choddak, Captain Babbar and Captain Manik. PTI, New Delhi, 30 April : Government tonight alerted the Department of Space and ISRO for help in locating the whereabouts of the missing helicopter carrying Arunachal Pradesh Chief Minister Dorjee Khandu and four others. Union Home Secretary G K Pillai said that Indian satellites have made two passes over the probable area from where the Pawan Hans helicopter went missing 20 minutes after takeoff from Tawang in Arunachal Pradesh but has not picked up any signals. Pillai said depending upon the weather tomorrow morning IAF helicopters from Dibrugarh and Jorhat will carry out aerial recee. 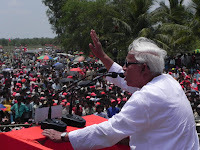 Khejuri, 30 April : West Bengal Chief Minister Buddhadeb Bhattacharjee today said that he wanted to make Nandigram as developed as Haldia and accused the Trinamool Congress of fomenting trouble there. 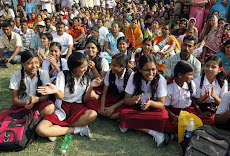 "We want to make Nandigram another Haldia. 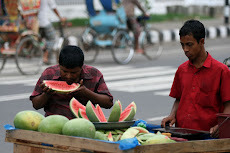 Haldia is a booming town now. It will continue to flourish. Thousands of people are working there. 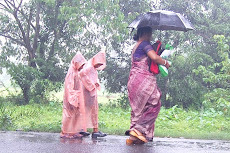 We have created Haldia. But Trinamool Congress has unleashed false propaganda and created trouble even after the announcement that we will not acquire land in Nandigram," he told an election meeting here, a short distance away from Nandigram. 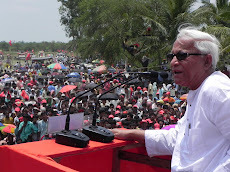 Buddhadeb Bhattacharjee said, "I had categorically stated that we will not acquire land in Nandigram. 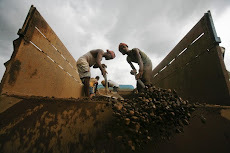 But they (TMC) did not stop fomenting trouble there and dug up roads." 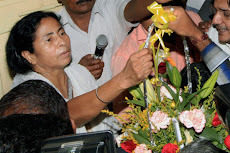 Howrah, 30 April : Trinamool Congress chief Mamata Banerjee today took a dig at West Bengal Chief Minister Buddhadeb Bhattacharjee for sharing the dais with CPI(M) leader Anil Basu who had come under fire for making derogatory remarks against her. 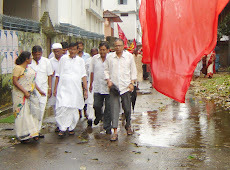 "The CPI(M) has a face and a mask to conceal it. While the face is used to abuse, the mask says that it is not proper to be so," Mamata told an election meeting here in Howrah district referring to the Chief Minister asking Anil Basu to apologise for his foul language. 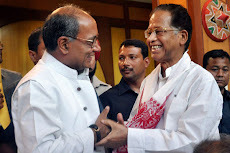 This is the first time that the Chief Minister met Anil Basu yesterday after he censured the former party MP for using intemperate language against Mamata. Anil has been barred from addressing election meetings. 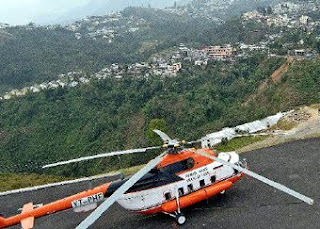 PTI, Shillong, 30 April : The Meghalaya government today suspended the Pawan Hans helicopter services operating in the state with immediate effect, hours after Arunachal Pradesh Chief Minister Dorjee Khandu's helicopter went missing and was found later in Bhutan. Transport Minister A T Mondal told PTI that he instructed his office to close down the company's office in Guwahati and not issue any more tickets. 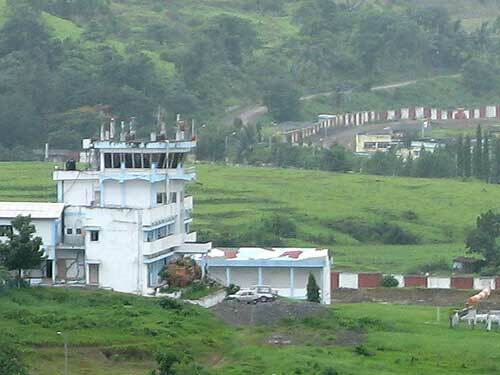 Mondal said the license of Pawan Hans to operate in Meghalaya had expired long ago, but due to requirements of the service it was allowed to operate. The state, he said, would write to the Centre and call for fresh tenders for operating the service. 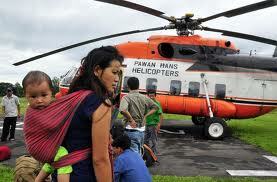 The lone Pawan Hans helicopter operates from Shillong to Tura via Guwahati and back daily. "We have not blacklisted Pawan Hans. 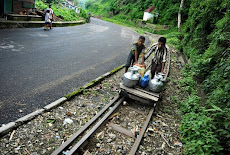 They can apply (for license) again, but they have to be competent," Mondal said. Kolkata, 30 April : Altogether 12 Air India flights were cancelled till 5 pm today from the Netaji Subhas Chandra Bose International Airport here on the fourth day of the strike of the airline's pilots, sources said. The destinations of the cancelled flights were Mumbai, New Delhi, Guwahati, Gaya and Imphal. Air India sources here said five flights from Kolkata to Silchar, Shillong, Port Blair, Dibrugarh, Bagdogra operated as per schedule. 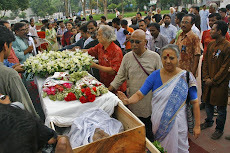 Akram Hosen Mamun, Dhaka, 30 April : It is widely believed that Rabindranath Tagore, one of the greatest poets of the world, was well ahead of his time. 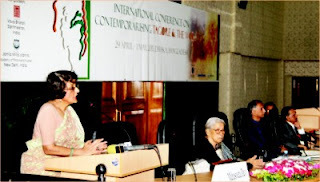 At the major international conference, titled “Contemporarising Tagore and the World” that was inaugurated at the Nabab Nawab Ali Chowdhury Senate Building, University of Dhaka (DU) on 29 April, literary and social science scholars from around the world are contextualising Tagore's works in today's world. 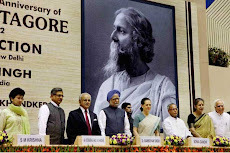 Organisers informed that under the broad theme of 'Contemporarising Tagore', the discussants may narrow down their focus on the sub-themes of 'Nationalism, Internationalism and Cosmopolitanism'; 'Crisis in Modern Civilisation'; 'Tagore's Humanism: Life, Gender and Religion'; 'Education and Creativity' and 'Alternative Development Strategies'. PTI, New Delhi, 29 April : The Centre will come out with a "detailed response" on the allegations that the 1995 Purulia arms drop case was aimed at "destabilising" the then West Bengal government. 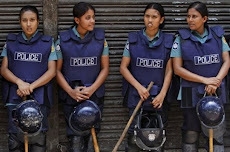 Porimol Palma, Dhaka, 29 April : Around 1,000 Bangladeshi garment workers in Jordan have joined their several thousand Asian colleagues in a strike demanding higher wages. Sri Lankan workers first went on strike early this month and their fellows from India, Bangladesh and China followed suit, migrants in Amman said. The Jordan government, however, said it is not in a position to increase the salary abruptly, noted Toufiq Islam Shatil, first secretary of Bangladesh embassy in Jordan. 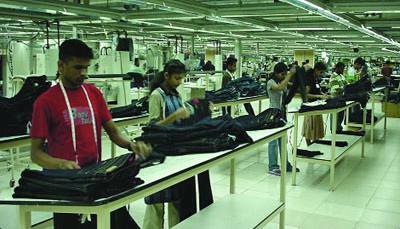 The company owners have stopped supplying food, water and electricity to the labour hostels for the last two weeks, Altaf Hossain, a worker of Starling Apparel Manufacturing at Al Tajamouat Industrial City in Amman, told The Daily Star today evening. "We are buying bottled water, candles and food on our own," he added. As per his five-year-old job contract, his wage is JD 110, but a year ago the Jordan government announced to increase it to JD 150, which the company owners are not complying with, complained Altaf. 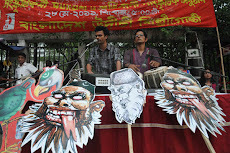 PTI, New Delhi, 29 April : The Central Bureau of Investigation on Friday said there was no evidence linking any Indian politician or government agency with the Purulia arms drop case of 1995, dismissing claims of accused Kim Davy that the clandestine work was carried out by "political forces" at the Centre to destabilise the Left front Government of West Bengal. The agency said it has "clinching" evidence against mastermind Kim Davy's alleged "act of terror" and is making all efforts to bring him to India to face trial in the case. UNI, Port Blair, 29 April : Pinched by the drastic rise in the airfare, the Andaman Chamber of Commerce and Industry (ACCI) has requested the Air India Authorities to introduce at least two additional flights per week from Kolkata and Chennai to Port Blair. 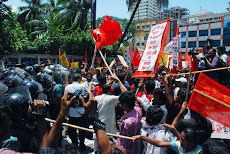 "As the fares of airline tickets are sky rocketing and the general public traveling from Port Blair to mainland and vice versa are being put to undue hardships due to drastic rise in the ticket fares which are required to be reduced for the benefit of the common man," G Bhasker, president of Andaman Chamber of Commerce and Industry told UNI. He said general public of remote Andaman and Nicobar Islands and visiting tourists, have been complaining that flight tickets are not available frpm last week of April to last week of May 2011 due to heavy traffic congestion. Meanwhile, the ACCI President had sent a letter to General Manager, Air India, Kolkata, the Chief Secretary of A and N Administration and Station Manager, Air India, Port Blair, requesting them to introduce two additional flights for the period from last week of April to last week of May 2011 to ease the present air ticket crisis and to bring down the fares to an economical level so that common man can afford to avail the flights. Andaman and Nicobar Islands are at present connected with Air India, Kingfishers and Jet lite aircrafts but airfare are soaring sky high. Every year during vacation and peak tourist seasons, one way fares for Port Blair often reach upto more than Rs 17,000. Kolkata, 29 April : Eight Air India flights were cancelled till 03 pm today from NSC Bose airport here on the third day of the pilots' strike. The destinations of the cancelled flights were Guwahati, Gaya, Imphal, Port Blair, Mumbai and Delhi. Air India sources here said that six flights for various destinations took off as scheduled. 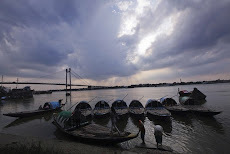 Kolkata, 29 April : The gross revenue of power utility Calcutta Electric Supply Corporation (CESC) Limited has crossed Rs.4,000 crore ($9 million) during FY11, its vice-chairman Sanjiv Goenka said Friday. "CESCs gross revenue for the first time has crossed the Rs.4,000 crore mark. Profit Before Tax (PBT) for the fourth quarter of the last financial year increased by 17 percent to Rs.142 crore from Rs.121 crore during the corresponding period in the previous year," Goenka told reporters here. Kolkata, 29 April : With the state pollution control board tightening the noose, political parties have adopted eco-friendly measures during campaign for the Assembly polls in West Bengal this time. 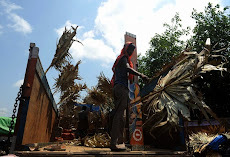 As party workers went round soliciting votes, they kept in mind people''s sensitivity about environment by obeying restrictions on the use of loudspeakers, avoiding use of plastics in making party flags and using only diesel generator sets during power cuts, PCB officials said. Days ahead of the fourth round of the six-phase poll, the pollution watchdog has not received any complaint against violation of its green guidelines issued to all 24 political parties after the campaigning began early last month. "There have been no complaints because the High Court and the Election Commission supported us when some political parties threatened to go against our guidelines in using loudspeakers," WBPCB''s chief law officer Biswajit Mukherjee told reporters. 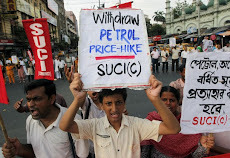 Also because none of the candidates wanted to attract voter''s ire by polluting the environment, Mukherjee observed. During election campaign, rampant use of loudspeakers by all parties result in noise pollution while a huge quantity of waste materials are generated from the preparation of flags, festoons, banners, etc. which cause environmental hazards. But with an increased awareness on environmental issues this election season, politicians adopted the ''Go Green'' mantra. 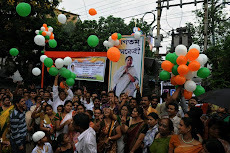 Besides following the 55-65 decibel limit while using loudspeakers, the main opposition party Trinamool Congress even introduced banners made from biodegradable jute. 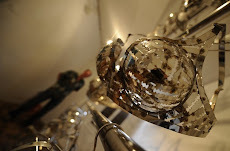 "Ours is a complete eco-friendly campaign as we avoided the use of plastics as much as we could. 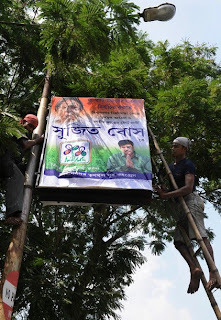 We are the first political party in West Bengal to have adopted jute for roadside banners. Guwahati, 29 April : The Guwahati High Court today stayed the imposition of service tax on lawyers till further hearing on 25 May. A Division Bench comprising Justices Amitava Roy and A K Goswami passed an interim order on the petition filed by Guwahati High Court Bar Association challenging the imposition of service tax on lawyers as per the Finance Act 2011 effective from May One, 2011. BSS, Khulna, 29 April : Archeologists tracked down the ancestral home of Nobel Laureate Rabindranath Tagore in Khulna on Thursday as the nation is to review early next month his rich contributions to the literature and the development of Bengali nationhood marking his 150th birth anniversary. 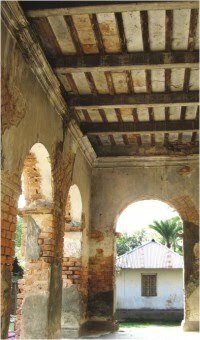 An archeology department team carried out a daylong initial experimental excavation on the ancestral house of the great poet in Pithabhog village of Rupsha upazila as an earlier archeological survey found clues of his ancestral links. “Today we found the outline of the ground layout of the house and now we are preparing a proposal for complete excavation of the structure and its preservation as an archeological heritage,” regional director of the department Shihab Uddin Mohammad Akbar told the news agency at the scene. 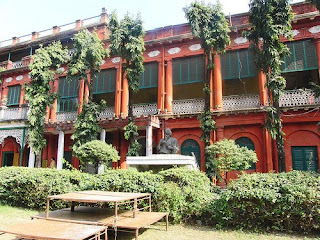 He said after excavating only three to four feet soil, his team found the layout of an estimated 30 feet by 20 feet building that once accommodated the poet’s forefathers while officials including the Upazila Nirbahi Officer (UNO) of Rupsha Mohammad Monirul Islam witnessed the exploration campaign. 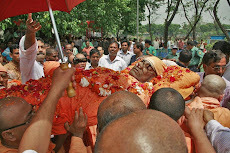 Akbar said he would also send a proposal to set up a Rabindra Smrity Sangrahashala at the sight. 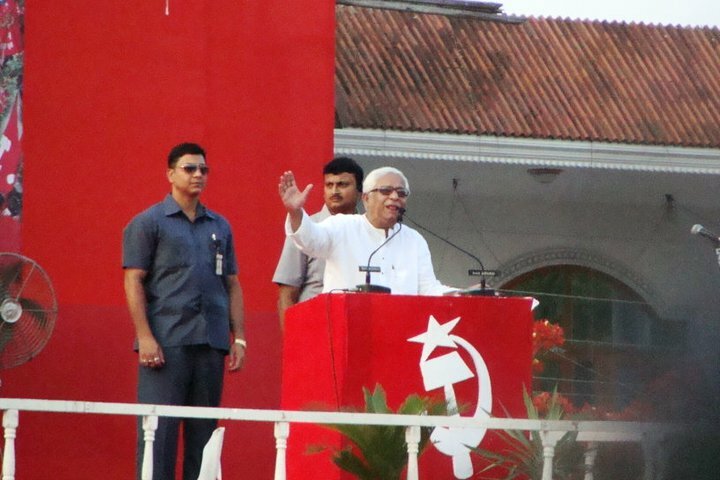 Dankuni, 28 April : Foreign powers tried to destabilise the Left Front government in West Bengal, while there were forces within the country also which tried to do the same thing, West Bengal Chief Minister Buddhadeb Bhattacharjee said today. 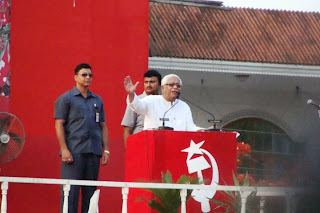 "Foreign powers have tried to dislodge the Left Front government in the past and the conspiracy is still continuing," the chief minister told an election rally here in Hooghly district. 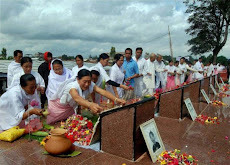 Stating that foreign powers had made an attempt to dislodge the government by dropping arms in Purulia district on 17 December, 1995, he claimed that 'the conspiracy was continuing'. He also said there were many forces in the country bent upon dislodging the Left Front government. 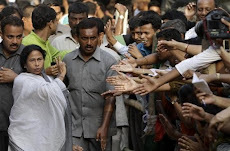 The chief minister raked up Trinamool Congress' 'huge poll expenditure' and said "full bench of Election Commission has arrived in Kolkata and our views have been submitted before it. 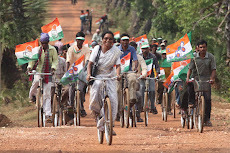 "The Trinamool Congress has been spending huge sums of money and we want to know from where it has come," he said. 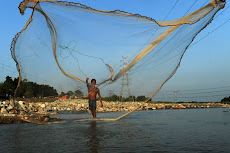 UNB, Dhaka, 28 April : The World Bank will provide US$ 1.2 billion to Bangladesh as IDA loan for the construction of the 6.15-kilometer Padma Bridge connecting Maowa in Munshiganj and Shariatpur over the River Padma. A loan agreement to this effect was signed Thursday by Economic Relations Division (ERD) secretary Mosharraf Hossain Bhuiyan and World Bank country director Ellen Goldstein. Finance Minister AMA Muhith, Planning Minister AK Khandker and Communications Minister Syed Abul Hossain, PM’s Finance Advisor Dr Mashiur Rahman and visiting World Bank managing director Ngozi Okonjo-Iweala were present at the signing ceremony held on a Ro-Ro ferry ‘Language Martyr Barkat’ on midstream of the Padma. 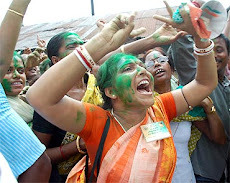 Nandigram, 28 April : Nandigram, the site of anti-land acquisition movement, will spearhead change from three decades of Left Front rule in West Bengal, Trinamool Congress chief Mamata Banerjee claimed today. "Nandigram will be the turning point for change for the ouster of the CPI(M) from power after 35 years of misrule," Mamata told an election rally here in East Midnapore district. 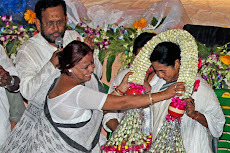 "I've decided to begin my poll campaigning for East Midnapur from here where hundreds of people fought against the atrocities of CPI(M) cadres," Mamata Banerjee said while referring to the death of 14 persons in East Midnapore district in police firing on 14 March, 2007. UNB, Munshiganj, 28 April : World Bank Managing Director Ngozi Okonjo-Iweala Thursday said in Munshiganj, the Bank would not compromise on quality in construction of the proposed multi-purpose Padma Bridge. “We’ll not compromise with the quality in constructing the bridge,” she said reiterating that the Bank wants to see zero corruption while implementation of the Bridge. 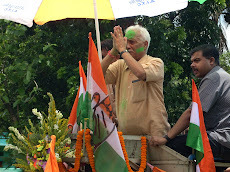 Kolkata, 28 April : Chief Election Commissioner S Y Quraishi today said he received some fresh complaints from West Bengal Housing Minister Gautam Deb on alleged illegal money used by the Trinamool Congress in poll campaigns, but said it was not conclusive evidence. "Gautam Deb has given me a complaint, but the documents submitted are not signed and there is no conclusive evidence," Quraishi told a press conference here. Kolkata, 28 April : West Bengal Housing minister Goutam Deb today met the full Bench of Election Commission headed by Chief Election Commissioner S Y Quraishi, with his allegation that the Trinamool Congress had used black money to fund its election campaign. 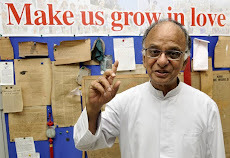 Goutam Deb, who was given 10 minutes for the meeting by the EC told reporters afterwards that he had given the bank account details of a number of Trinamool Congress candidates. Goutam said that he also drew the EC's attention to the use of helicopters by the Trinamool Congress and the claim by Wikileaks on a purported US diplomatic cable stating that the US should cultivate Trinamool supremo Mamata Banerjee as she could be the next chief minister of West Bengal. He claimed that he also produced parts of burnt Trinamool Congress subscription coupons which he alleged was done to erase proof of use of black money. 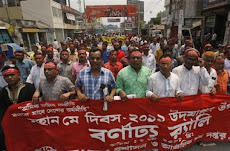 Dhaka, 28 April : A Bangladeshi parliamentary special committee will invite eminent journalists and intellectuals for talks to have their opinion on constitutional amendments, said co-chair of the committee Suranjit Sengupta yesterday. Suranjit, spokesman for the special committee on constitutional amendment, during a press briefing at the Parliament's Media Centre said the committee will sit with the country's senior journalists next Tuesday and with the intellectuals on Wednesday. 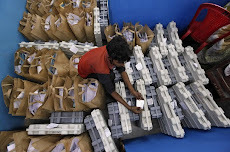 Kolkata, 28 April : The full bench of the Election Commission (EC) today arrived in Kolkata to oversee the poll preparedness for the last three phases of the West Bengal assembly polls. 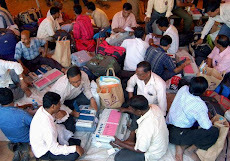 After reaching the city, Chief Election Commissioner S.Y. Quraishi and the other two Election Commissioners, V.S. Sampath and H.S. 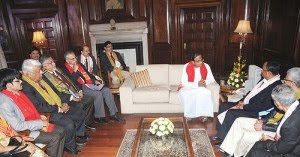 Brahma met the representatives of nine registered political parties. The bench of the Commission will meet the district administration of seven districts who are going for polls in the remaining three phases. 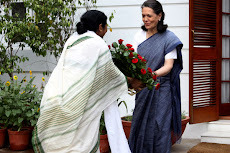 They will also hold meeting with the district magistrates, police superintendents, DIGs and IGs of police and divisional commissioners of the seven districts, Howrah, Hooghly, East Midnapore, Burdwan, and Maoist-infested West Midnapore, Bankura and Purulia, which will go to polls in fourth, fifth and sixth phases. PTI, Itanagar, 28 April : Arunachal Pradesh today raised concern over the Centre''s alleged apathy in implementing the ''Look East'' policy aimed at boosting development in the North-East. "The North-East is lagging behind other regions of the country because of the failure of the Centre to implement the Look East Policy in real terms," Public Health Engineering Department (PHED) Minister Chowna Mein told the 13th annual conference of the North East Region Commonwealth Parliamentary Association (NERCPA) here. 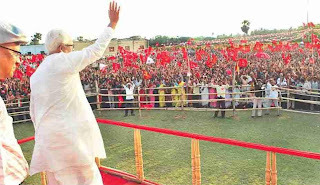 PTI, Pune, 28 April : The Pune rural police registered an FIR against Tripura Governor D Y Patil and kin in connection with a fraud case following direction by a local court, police said today. According to Talegaon Dabhade police, who registered the complaint filed by one Sampat Pawar on Tuesday, Patil, his wife Pushpalata and two sons-Ajinkya and Vijay, were booked under sections 420 (cheating and dishonesty inducing delivery of property), 467 (forgery of valuable security, will etc), 468 (forgery for purpose of cheating)and 471 (using as genuine a forged document or electronic record) of IPC. The police move came after Wadgaon Maval court issued orders for the same. 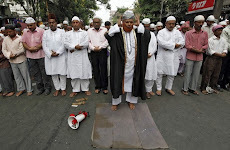 Kolkata, 28 April : Eight Air India (AI) flights from Kolkata airport were cancelled Thursday, putting passengers to great inconvenience, as the strike by pilots of the state-run airline entered the second day. According to AI official, two flights to Delhi, and one each to Mumbai, Imphal, Bagdogra, Port Blair, Agartala and Dibrugarh were cancelled at the Netaji Subhash Chandra Bose International Airport here. However, a flight each to Delhi, Silchar, Guwahati, Imphal and Shillong were operated. 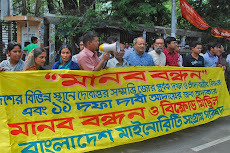 IANS, Dhaka, 28 April : Bangladesh's apex business chamber chief has criticised lawmakers who make laws, but cannot even read English. Federation of Bangladesh Chambers of Commerce and Industry president A.K. Azad Wednesday also criticised lawmakers, judges and members of his own business community for engaging in corruption. Some members of parliament even do not know the minimum level of English. What is their calibre? But they are in a position of making laws and holding the power of impeachment. Shame! And a number of them do not know the difference between a doctor as a physician and a doctor as the holder of a PhD degree, New Age quoted him as saying at an advocacy workshop on business ethics organized by the International Business Forum of Bangladesh. 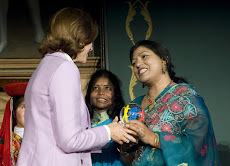 At 48.8 percent of literacy, more than half of Bangladesh's population is illiterate. Azad also criticised judges, businessmen and government officials for corrupt practices. Only three judges submitted their wealth statement. What about others? Why did not others submit their wealth statement, he asked. It is very difficult to find 10 businessmen, 10 lawyers and 10 judges who maintain ethics, he observed. He suggested that ethics should be practised from the top level in all communities. The country rates high on graft as per the rating by the Transparency International, a global watchdog against corruption. PTI, Imphal, 28 April : Unidentified militants hurled a powerful grenade at a school premises in Imphal west district of Manipur but the device failed to explode, officials said today. The militants lobbed the grenade inside the premises of Jim Higher Sceondary School at Sangaiporou at the outskirts of Imphal late last night, they said. 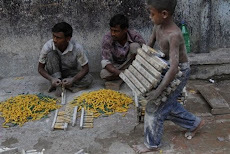 New Delhi, Kolkata, 28 April : In explosive revelations in the Purulia arms drop case, prime accused Kim Davy, Thursday, claimed that the entire operation to smuggle in huge quantities of arms and ammunition was carried out with the implicit approval of the top most echelons of power in India. Davy, who is known by many aliases, had played an active role in the infamous incident in which a large consignment of arms, including several hundred AK-47 rifles, and ammunition was dropped from a Latvian aircraft on the night of 17 December, 1995 in West Bengal's Purulia district. 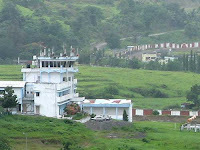 Before the aircraft could leave Indian airspace it was intercepted by the Indian Air Force and forced to land in Mumbai. However, Davy managed to escape from the airport under mysterious circumstances while the others in the aircraft - five Latvian citizens and Peter Bleach, an ex-Special Air Service operative and British intelligence officer - were arrested and tried in court. They were sentenced to life imprisonment; all were, however, released subsequently. 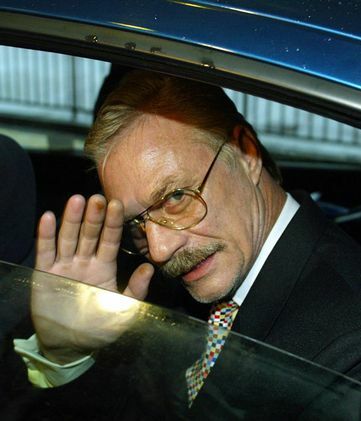 India government had been looking for Davy and after it came to light that he was in Denmark, a formal extradition request was forwarded to the Danish authorities. 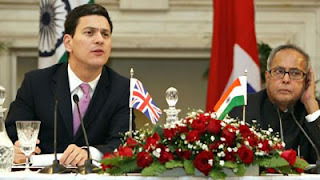 Speaking to a Indian news channel Times Now, Davy said that he has decided to come out with his story now as he fears that he would be extradited to India and treated as a terrorist when the whole operation was planned by powerful people from within India. 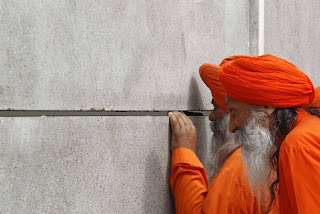 He said that India’s external intelligence agency, the Research and Analysis Wing, knew everything about the operation and had worked in tandem with British agency MI5. “There was communication between RAW and MI5. RAW knew everything. The cargo, the drop plan, the location,” Davy said. “Who will fly to India from Pakistan without clearance? It is unthinkable,” he added, while also revealing that he was called to Karachi on 16 December, a day prior to the arms drop, and told that he will have to finish the job within 48 hours otherwise the “window” would get closed. To authenticate his claims, Davy said that the subsequent court case had proved that the military radar meant to keep track of the aircraft’s flight path was switched off that night on orders from RAW. “What I am saying is just the logical explanation, don’t take my word,” he quipped. Revealing more explosive information, he said prior and immediately after the arms drop he was in touch with a Member of Parliament, who in turn told him that the PMO was in the loop. 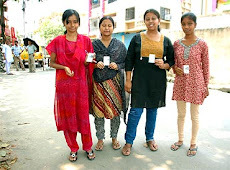 Kolkata, 27 April : A total 78.3 per cent of the electorate today cast their votes in 75 seats in the metropolis and adjoining North and South 24 Parganas districts which went to polls in the crucial third phase of West Bengal Assembly elections. 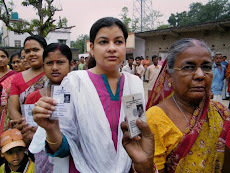 78.3% turnout in crucial third phase of West Bengal assembly poll, says Election Commission. 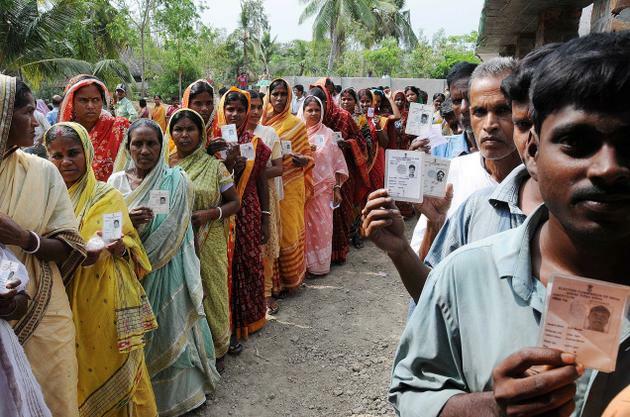 The polling percentage might rise as reports from remote areas of South and North 24 Parganas districts were still awaited, the state''s chief electoral officer Sunil Gupta told reporters here. He said polling was 82.6 per cent in South 24 Parganas district, 80 per cent in North 24 Parganas districts, while Kolkata (south) registered 63.5 per cent and Kolkata (north) 61.6 per cent. 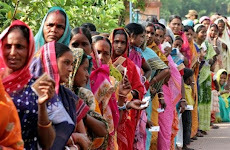 Barring for some stray incidents ,the polling was by and large peaceful, Gupta said. 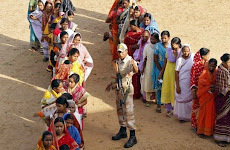 Tight security arrangements have been made in polling booths with deployment of central forces. 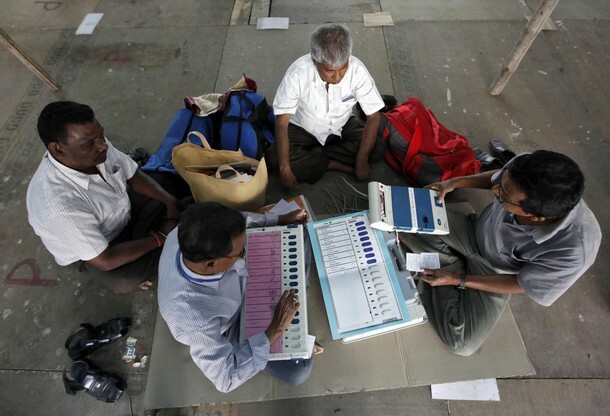 The total electorate of the 75 seats is 1.44 crore. Enthusiasm among the voters, mainly new voters, were evident at many booths. 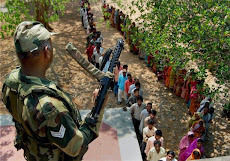 Serpentine queues could be seen before many polling booths where people stood in line to cast their voters even before the polling began. Malfunctioning of EVMs were reported from a few places which were promptly replaced, Election Commission sources here said. Left Front chairman Biman Bose demanded repoll in 40 booths - 22 of Bijpur and 18 of Haroa in North 24 Parganas district - accusing the Trinamool of driving out CPI(M) agents and indulging in electoral malparactices. 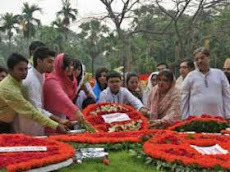 Dhaka, 27 April : Awami League president Sheikh Hasina on Wednesday said her party is in favour of restricting the tenure of caretaker government (CG) to 90 days, suggesting the CG’s failure to hold elections by the stipulated time would result in reinstating the previous government to do so. Hasina, also the prime minister, opined for having Islam as state religion and said people of other religions will enjoy equal rights and respect. 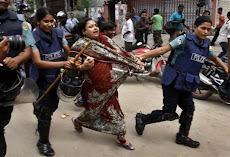 She said these at a press briefing at Gonobhaban in the afternoon after making clear her party's stance on some crucial constitutional issue before the parliamentary special committee on constitutional amendments at the Jatiya Sangsad Bhaban. 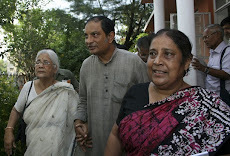 The meeting started at about 12:20pm(BDST) after Hasina reached there along with some of her party leaders. 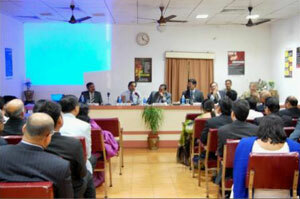 Briefing journalists later in the day, Hasina expressed her party’s stance for having the CG system. PTI, New Delhi, 27 April : The prevalence of money and muscle power in elections has created a situation where ordinary people do not get a level-playing field, Chief Election Commissioner S Y Quraishi said today. Agartala, 27 April : Tripura Chief Minister Manik Sarkar today demanded 50 per cent share of the Central tax for the states instead of the current 32 per cent. Inaugurating a check post at Churaibari on the Assam-Tripura border in North Tripura district, Sarkar said, Centre should sanction 50 per cent share of the Central taxes for the states to ease tax burden on the common people instead of sharing only 32 per cent of the Central taxes to the states. 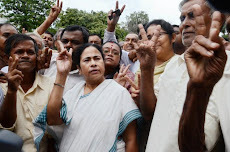 Kolkata, 27 April : Trinamool Congress chief Mamata Banerjee today alleged that the CPI(M) tried to rig some booths in the Jadavpur assembly polls, saying the Election Commission had been informed about it. 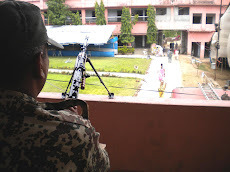 "Attempts at rigging in some booths in the Jadavpur seat have been reported to me and I have information that central para-military personnel have been rendered idle and the state police asked to do the duty, slowing polling process at the instruction of the chief minister," Mamata told Bengali TV news channel, Star Ananda. 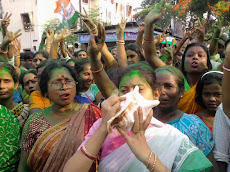 Jadavpur constituency witnessed a keen contest between the chief minister and state's former chief secretary Manish Gupta (Trinamool Congress) in a 13-cornered contest. PTI, Aizawl, 27 April : Only 55 Bru refugees, belonging to 12 families, returned to Mizoram from Naisingpara relief camp in neighbouring North Tripura district today as the officials were making arrangements for the return of 123 families, a senior police official said. 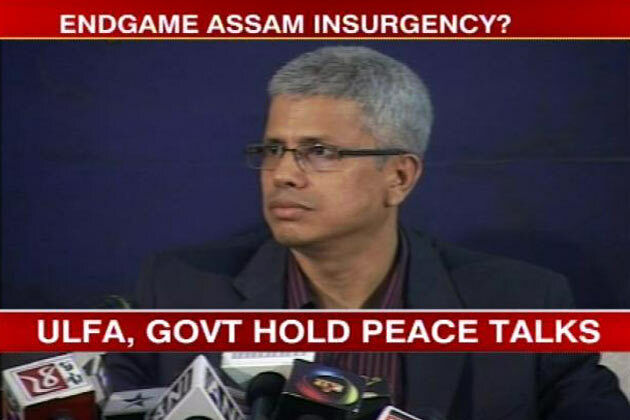 H. Sangawia, the SP of Mamit district on Tripura border, told PTI that though the officials had initially expected that at least 53 families would be repatriated today, the majority refused to return. "I do not know why they turned against as I could not contact the officials who went to Tripura to oversee the repatriation process," he said. “We will give 1.2 billion US dollars of the total amount as confessional credit for the construction of Padma Multipurpose Bridge Project,” she told reporters after a meeting with Finance Minister AMA Muhith at his ministry. 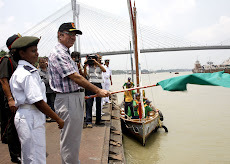 Ngozi said it is possible to complete the work of Padma Multipurpose Bridge, the country's largest ever infrastructure development project during the regime of the present government if the work will be done properly. “We’ll give priority to three issues - very often procurement, no corruption and transparency - in implementing the project,” she further said. 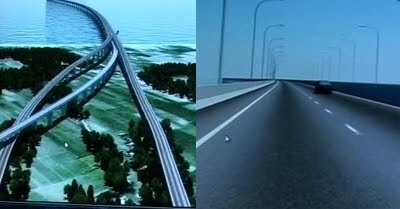 Finance Minister AMA Muhith said the World Bank is giving the highest aid to Bangladesh in the single project of Padma Multipurpose Bridge. PTI, New Delhi, 27 April : In what appears to be a perfect example of madness sans method, a group of about 40-odd die-hard fans is planning to enter the Eden Gardens during the Kolkata Knight Riders-Kings XI Punjab IPL match on Saturday, protesting the absence of Sourav Ganguly from the home squad. 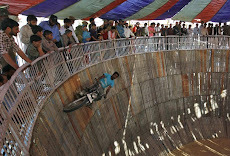 This despite the fact that the Indian Premier League has already entered its halfway stage. Fibbed into believing that their hero may still make it to the IPL, thanks to the endless speculations in the media, a group called "No Dada, No KKR" has been actively campaigning for Ganguly's return to the Knight Riders squad. The former India skipper went unsold in the January auction, but those associated with this group are yet to come to terms with the fact that their hero is no more a part of the KKR squad. 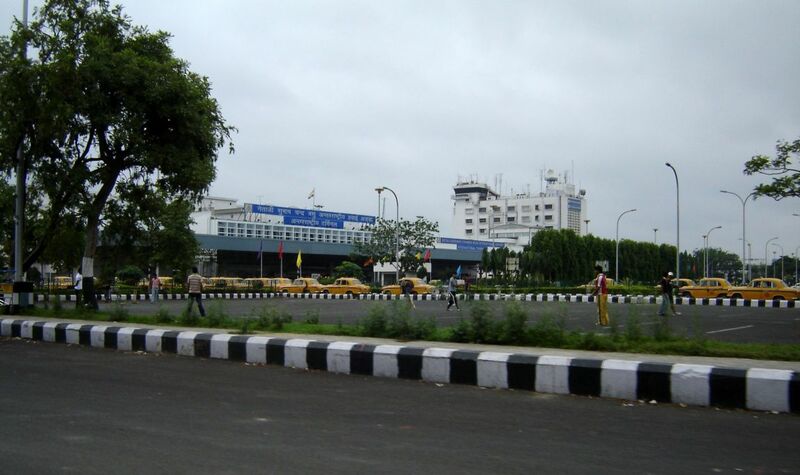 Kolkata, 27 April : Air India pilots' strike has had little impact so far on flight operations at the city airport. While Delhi-Kolkata flights were a little delayed, other Air India flights left on time from the N S C B International airport here today, AI sources said. Delhi-bound passengers were sent in two combined flights, while 12 other flights for Mumbai, Port Blair as well as Delhi departed according to schedule, sources said here. Airport sources said flights from Delhi were, however, delayed by 10-30 minutes. AI management said efforts were being made to run operations in a normal manner and customer care officials have advised to keep the passengers informed of changes in flight schedule. "We urge our passengers to bear with us," the statement said. 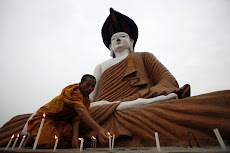 Guwahati, 27 April : A slight intensity earthquake with epicentre on Assam-Meghalaya border tonight shook the North-East. Indian Meteorological Department said that the 4.3 magnitude earthquake struck at 22.31 hours yesterday. There was no immediate report of any loss to life or property. The Congressionally-mandated Diversity Immigrant Visa Program makes 50,000 permanent resident visas available each year to nationals of countries with historically low rates of immigration to the United States. Diversity Visa recipients are drawn from a random selection among all entries worldwide. Once online at the Entry Status Check for Diversity Visa 2012 webpage, applicants will be required to enter information that can be found on the printed confirmation page from their online DV entry. This confirmation page must have been printed at the time the online submission was made, and retained by the applicant. If the applicant did not keep the printed confirmation page, there is no way to recapture that information. Neither the U.S. Embassy nor the Department of State will be able to replicate this confirmation page and the applicant will not be able to check their status online nor process their visa case further. Receiving a “winning” notification through the online status check does not in itself qualify an entrant for a visa. There are two criteria that all entrants must meet in order to qualify for a Diversity Visa. 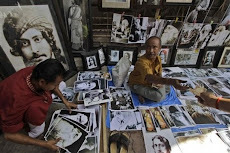 First, entrants must accurately complete the online entry form and submit a recent photograph. Second, entrants must show that they have either the required education or work experience. We strongly encourage prospective entrants to evaluate their educational and occupational qualifications against the DV program requirements before entering the lottery. Those who see on the Entry Status Check webpage that they have won the Diversity Visa lottery will receive instructions on the website for the next steps in the visa process. 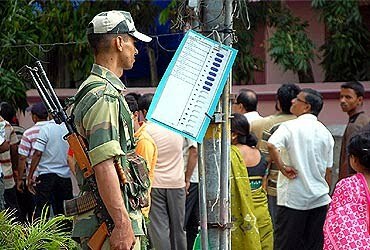 Kolkata, 26 April : Elaborate security arrangements have been put in place in West Bengal ahead of the crucial third phase of the assembly polls beginning Wednesday. 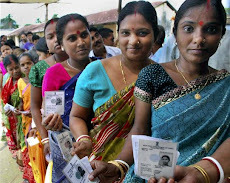 The elections will take place in 75 seats spreading over Kolkata, North 24-Parganas and South 24-Parganas districts in which over one crore, forty-four lakh, fifty five thousand voters will decide the fate of the candidates. 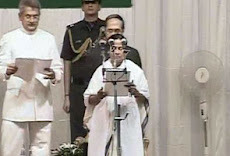 The fate of 479 candidates, including Chief Minister Buddhadeb Bhattacharjee and nine other ministers would be decided in this phase. While Bhattacharjee takes on his one-time chief secretary and Trinamool Congress candidate Manish Gupta in Jadavpur constituency in South 24-Parganas district, Finance Minister Dr Asim Dasgupta is pitted against Trinamool Congress candidate and FICCI secretary general Dr Amit Mitra at Khardah in North 24-Paraganas district. 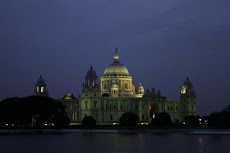 Other important candiadates contesting are Housing Minister Gautam Deb, Transport Minister Ranjit Kundu, Land Revenue Minister Abdur Rejjak Mollah, Sports Minister Kanti Ganguli (all CPI-M), Leader of the Opposition Partha Chatterjee and Kolkata Mayor Shovan Chatterjee (both Trinamool). 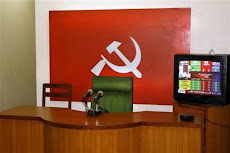 The CPI(M) is contesting in 61 constituencies, the CPI three, the Trinamool 70, the Congress five, Forward Bloc seven, the BJP 75, Revolutionary Socialist Party (RSP) three and the BSP 51 constituencies. 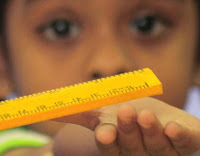 Dhaka, 26 April : Bangladesh government has formulated a new guideline banning corporal punishment in educational institutions. The government decision follows a 13 January High Court ruling that declared such punishments 'unconstitutional'. The 'Guideline to Stop Corporal Punishment to Students in Educational Institutions 2011' came into effect on Tuesday through an education ministry circular. According to the guideline, primary to university, including the madrasas, fall within the ambit of educational institutions. The circular said teachers found guilty of meting out corporal punishment to students would face measures under Civil Service Rules (discipline and appeal) 1985. Steps could also be taken under the criminal law, if necessary, it added. It also defines the 11 types of tortures, both physical and psychological it seeks to ban. The banned corporal punishments are to hit students with stick or anything else, throw dusters, chalks or other things, throw students down, pinch or bite, squeeze fingers with pencils in-between, push by the neck, twist ears or force the students to do sit-ups with hands holding the ears, ask to be half-bent with head under bench, table or chair, make them stand on their knees, facing the sun or lie under the sun and forcing them to do anything that is banned by labour laws. 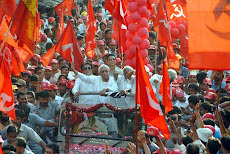 Howrah, 26 April : West Bengal Chief Minister Buddhadeb Bhattacharjee today held a roadshow in Howrah district in support of the Left Front candidates. Chief Minister started his roadshow from the Shibpur Botanical Garden in an open jeep along with the Left Front candidates of Howrah North, Howrah Central and Shibpur. 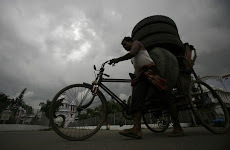 He covered a distance of around 15 km in the roadshow which ended at Salkia Chowrastha. 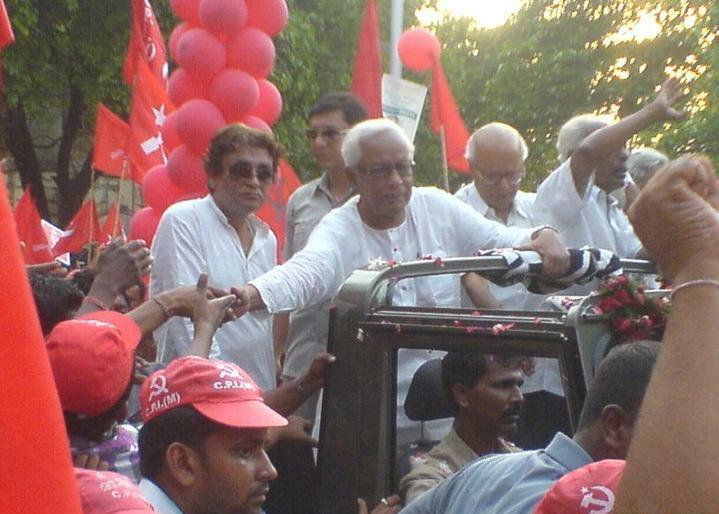 A large number of supporters joined Buddhadeb Bhattacharjee's roadshow. Agartala, 26 April : The Left Front government in Tripura, taking a cue from the Singur fiasco in West Bengal, today said that there would be no forcible land acquisition for industrialisation in the state. 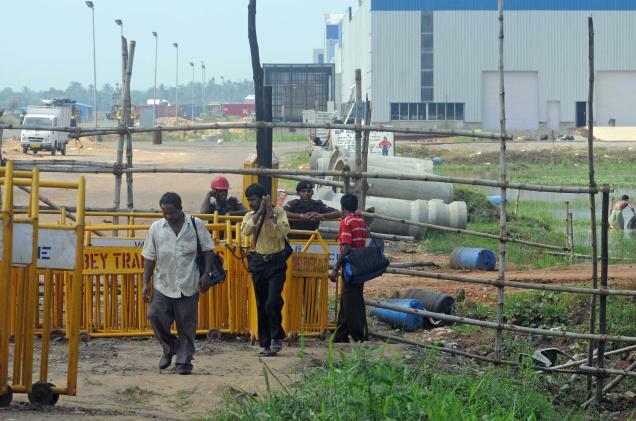 The government had served notices to some villagers near the Dukli Industrial Estate, about 10 km from here for its expansion, but following objections, the government stopped it, Industries and Commerce Minister Jitendra Chowdhury told reporters here today. "Government had planned to acquire 54.49 acre for expansion of the industrial estate. Of the the total targeted land, 46.53 acre is government land and the remaining owned by private parties. 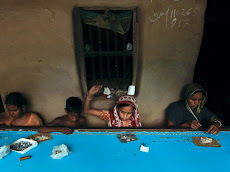 But following objections by some families we stopped acquiring land," Chowdhury said. "On principle we will not acquire land forcibly for industrialisation. 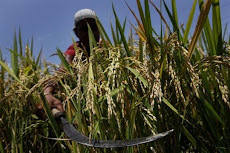 It affects the livelihood of the people," he said. 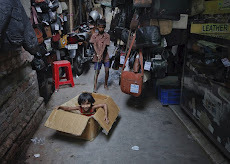 Kolkata, 26 April : Political parties contesting the West Bengal Assembly polls have been urged to make the plight of disadvantaged children a part of their agenda by child right activists here. "Since children do not vote, their problems are often ignored by politicians. We want their issues to be reflected in the agenda of candidates," said Atindranath Das of leading child rights organisation Child Rights and You (CRY). With support from partner NGOs, they have issued a child rights charter of demands to all political parties. Their demands include free education for those below 18, an end to child labour, food security, healthcare, legislation against child abuse and the formation of a state child rights commission. 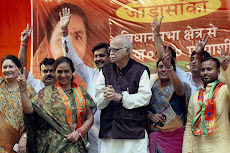 PTI, Burdwan, 26 April : Senior BJP leader L K Advani today agreed with Union Home Minister P Chidambaram''s statement that West Bengal was the worst governed state under the Left Front''s 34-year-rule and asked why the Congress-led UPA(I) took its support to run the country. 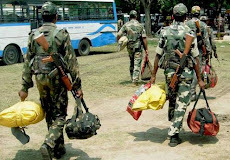 Guwahati, 26 April : ULFA today denied it has received Rs 40 lakh as daily expenses from the Centre. "A report (about pro-talk ULFA cadres receiving Rs 40 lakh from the Centre for daily expenses) which appeared in a section of the media is not only false, malicious and baseless but motivated and nothing but a conspiracy by a section of people," ULFA 'chairman' Arabinda Rajkhowa said in an e-mail statement. 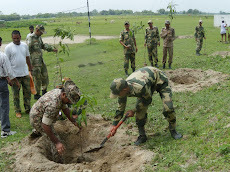 Kolkata, 26 April : Protecting the world from the adverse affects of climate change, the Sunderbans forests play a crucial ecological role by acting as a carbon sink and absorbing more than four crore tonnes of carbon dioxide from the atmosphere, according to a recent study. 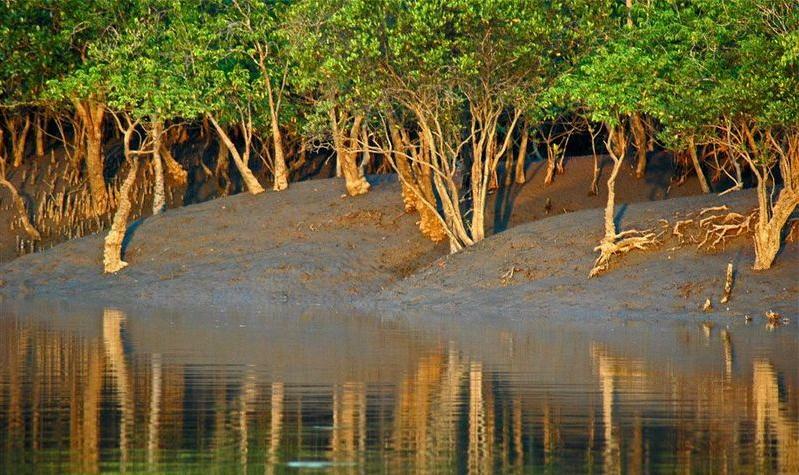 Having 2118 sq km of total mangrove forest cover, the Indian Sunderbans have soaked in 4.15 crore tonnes of carbon dioxide, valued at around USD 79 billion in the international market, researchers from the University of Calcutta said. "Mangrove trees act as a natural tank for carbon dioxide storage. 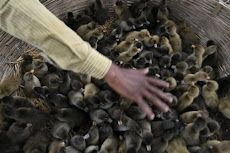 They absorb carbon for their own needs, which is a boon for us. 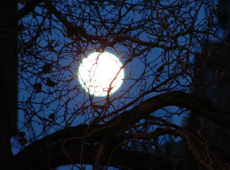 The more such biomass we have on earth, the more CO2 will be pulled from the atmosphere. 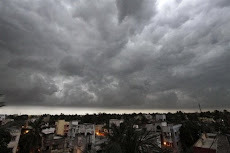 This will ultimately result in controlling the rise of atmospheric temperature and the subsequent climate change," says Prof Abhijit Mitra, who led the research. PTI, Aizawl, 26 April : Mizoram government has made preparations to repatriate 645 Bru refugees belonging to 123 families lodged in Naisingpara camp in neighbouring North Tripura district tomorrow, H Sangawia, Superintendent of Police of Mamit, a district bordering Tripura, said today. "However, we do not know (ultimately) how many people will return as there are still some elements who are discouraging the refugees to return for their own benefits," Sangawia said. 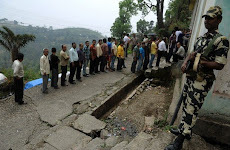 The Mamit district administration made necessary arrangements including security, he said. 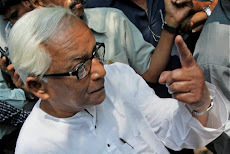 PTI, Thiruvananthapuram, 26 April : Renowned Bengali director Buddhadeb Dasgupta has been appointed chairman of the jury to select the Kerala State Film Awards for the year 2010. The jury, which will select the best article and book on cinema, would be headed by O K Johny, according to a release from the Kerala State Chalachitra Academy. 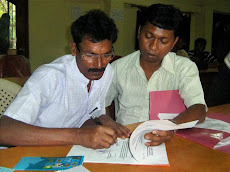 Secretary of the academy, K S Sreekumar, would be the member secretary for both the juries. 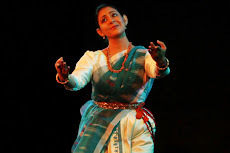 PTI, Kolkata, 26 April : As the daughter of Jagmohan Dalmiya, Vaishali wishes to hit the six with her debut production 'Bhorer Alo', which tells the tale of three generations of Bengalis. 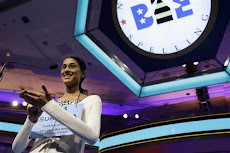 Vaishali, who wishes to make a good sports movie in future, wants to play a long innings in her chosen field. "I am fortunate to have a gifted director like Prabhat Roy whose script on three generations of Bengalis got me hooked the moment I heard the script. But this can only be the beginning, I am open to any good scripts," she told PTI. 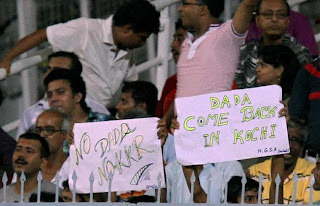 The cricket-freak, who used to accompany her cricket administrator father to the ground from the age of two-three, says Dalmia is also gung-ho about the movie. 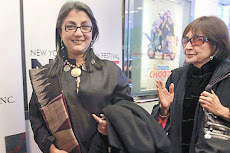 Vaishali says the Rituparno Ghosh starrer has all the elements of a clean family entertainer with dollops of romance, morality, suspense and mystery. 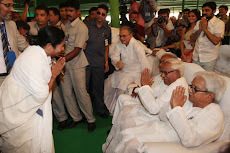 Udaynarayanpur (Howrah), 25 April : Responding to Home minister P Chidambaram's attack on the Left Front government in West Bengal, Chief Minister Buddhadeb Bhattacharjee today held him 'fully responsible' for unrest in Kashmir and Andhra Pradesh and asked him 'to take care of his own business'. 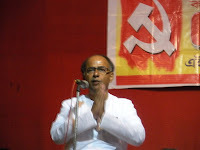 "Chidambaram described us as the worst-governed state, but he should give an account of how the central government is functioning," Bhatacharjee retorted at a Left front election rally here in Howrah district. "I advise that the doctor should treat himself first and not try to teach us as we are confident of taking care of ourselves," he remarked. 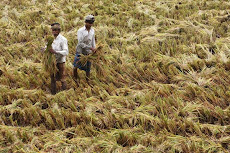 Dhaka, 25 April : A government committee that reviewed Grameen Bank's operations cleared it of any corruption in the handling of a Norwegian fund and said the microlender's interest rate is the lowest compared to the country's other microfinanciers. 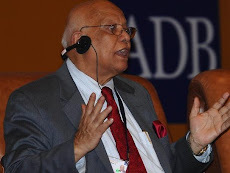 The committee thinks the fund has not been used for any dishonest purpose, said finance ministry officials, quoting the review report submitted to Bangladesh Finance Minister AMA Muhith today. It gives Grameen Bank a clean chit for the second time after the Norwegian government cleared clouds over the issue by saying the fund had not been used for unintended purposes. In an instant reaction, Grameen Bank expressed satisfaction over the report's findings on two pressing issues: the handling of the fund and microcredit interest rates. 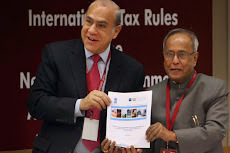 The committee, headed by Prof AK Monaw-war Uddin Ahmad, gave details of the formations and present status of Grameen Bank and 48 other associated organisations, in the report. The committee said the microlender crossed its authority in forming and financing its associated organisations, going beyond its mandate under the 1983 Grameen Bank Ordinance. 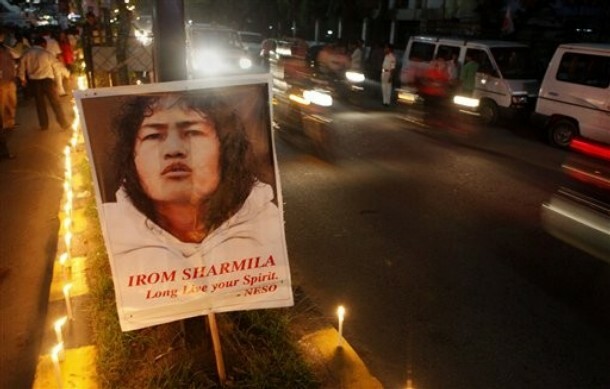 Candlelight vigil in support of Sharmila's decade long "fast"
Guwahati, 25 April : People from all walks of life today took part in a candlelight vigil here to extend support to Irom Sharmila of Manipur who is on a fast for over a decade demanding repeal of the Armed Forces (Special Powers) Act (AFSPA). The march was organised at the Dighalipukhuri area here by the influential North East Students Union (NESO) which alleged the Centre's apathy towards Sharmila. 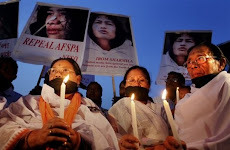 People, who took part, alleged that the Centre along with a large section of intellectuals and media had not given due attention to Sharmila's demand to repeal the controversial AFSPA. 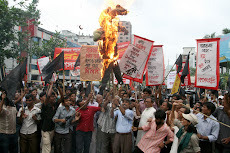 NESO chairman Samujjal Bhattacharya said the people of the northeast were united in their demand to repeal the Act. Dhaka, 25 April : Dr Ngozi Okonjo-Iweala, Managing Director of World Bank Group, arrives here tomorrow on a three- day visit to Bangladesh. This will be Dr. Okonjo-Iweala's second visit to Bangladesh since assuming her responsibilities. Her earlier visit was in March 2008. In addition to her corporate responsibilities and oversight of the Africa and South Asia Regions, Dr. Okonjo- Iweala is also the Chair of the World Bank Global Food Crisis Response Program, said a WB release here today. 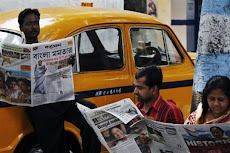 Kolkata, Canning, Garbeta, 25 April : Ahead of the third phase of polls, Indian Home Minister P Chidambaram today said the Centre has been keeping tab on law and order in West Bengal, which he held was "the worst governed state", with its financial health in a mess. 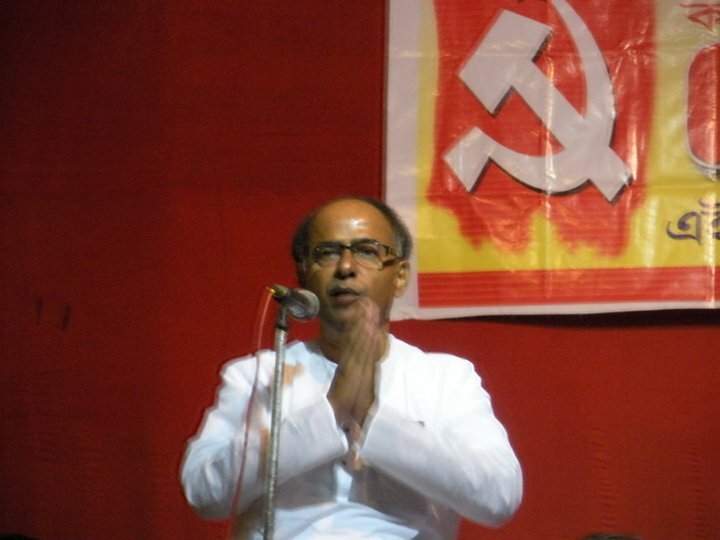 "If the CPI(M) thinks that we don't record what is happening in West Bengal, it is wrong. 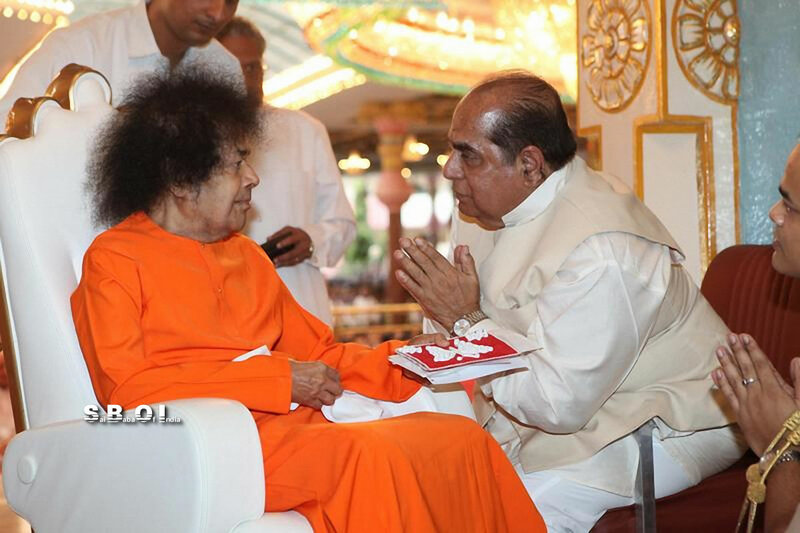 We know what has happened and what has been happening in the last 34 years in the state," he told a press conference in Kolkata and while campaigning at Canning in South 24 Parganas district and Garbeta in West Midnapore district. 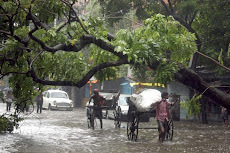 "I have been carefully watching the situation in West Bengal. For two and a half years ago, I have been keeping record of law and order in the state." "For too long we had a government that neglected governance. 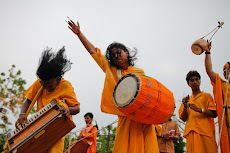 Purulia, 25 April : Union Finance Minister Pranab Mukherjee today urged the Maoists to shun violence and sit for talks to settle their demands. 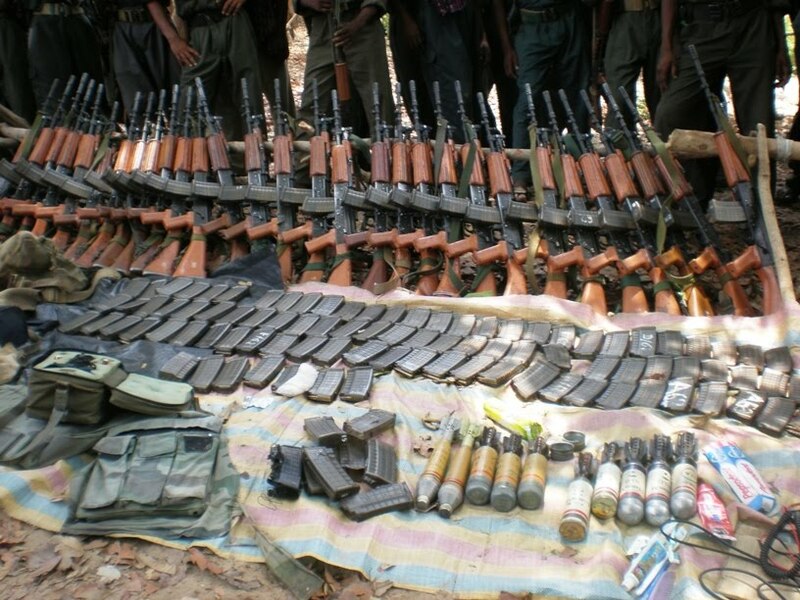 "I appeal to the Maoists to leave arms and come for negotiations with the government. 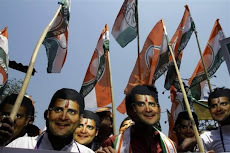 All their demands can be met through dialogues," the senior Congress leader told two election rallies at Barabazar and Santhaldihi, about 50 km from here. 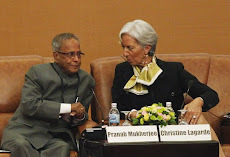 Holding the ruling CPI(M) responsible for the rise of Maoists in West Bengal, Pranab Mukherjee said nothing was done for the development of tribal areas by the Left Front Government despite having central funds for the purpose. 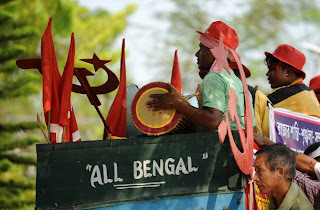 "Maoists are successful in spreading their network in the tribal areas taking advantage of the poverty and deprivation of the Adivasis in West Bengal. 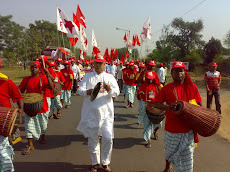 The Left Front Government did not respond to the cry for justice by the poor tribals," he said. 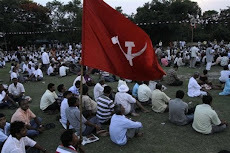 Kolkata, 25 April : CPI(M) today complained to the Election Commission that Trinamool Congress chief Mamata Banerjee had threatened the electorate during an election meeting here yesterday. 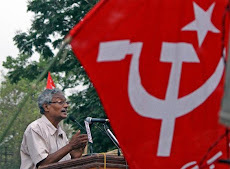 In a letter to the Election signed by CPI(M) on behalf of party state secretary Biman Bose, party state secretariat member Binoy Konar quoted Mamata as saying: "I know what power they possess! In 1972-77, they were defeated and all of them fled. 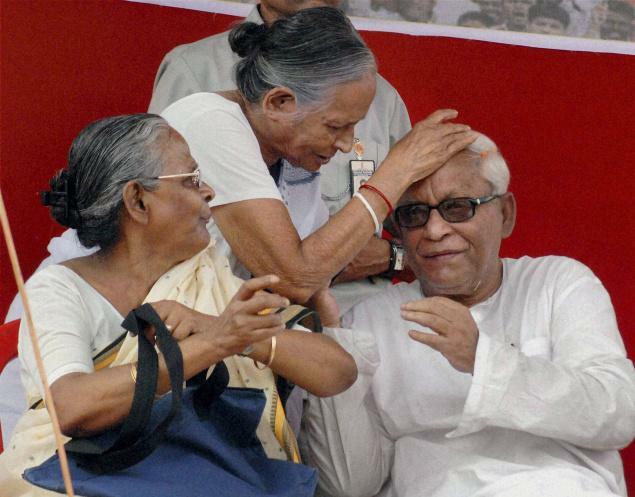 Thereafter, they came back again hanging on to the hands of Jayprakash Narayan; it is known how brave they are." The letter also quotes Mamata Banerjee as saying: "don't show goondas to me. I will thrust such goondas inside. They don't know me. I have many goondas under my control. They must not show me goonda power." Claiming that these statements amounted to intimidation of electors, Binoy Konar requested the EC to take immediate action against Mamata. 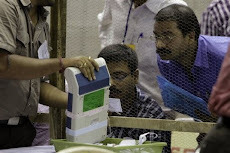 Kolkata, 25 April : The Election Commission in full strength will visit the city next week to oversee the election preparedness for the last three phases of Assembly polls in West Bengal, an EC official said here today. Chief Election Commissioner S Y Quraishi along with two election commissioners, V S Sampath and H S Brahma, will come to the city on 28 April, a day after the third phase of elections to be conducted in North 24 Parganas, South 24 Parganas and Kolkata, Additional Chief Electoral Officer N K Sahana told reporters here. Kolkata, 25 April : India government believes that police action and development must go together to deal with Maoists who are out of sync with the people, Union Home Minister P Chidambaram said today. "We place equal emphasis on development ... Our position is police action and development must go hand in hand," Chidambaram told a press conference here. "But we must take action also to tackle the Maoists, I don't think any party, including the Trinamool Congress, disagrees with that," he said. 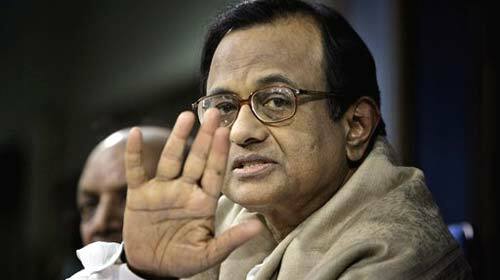 "In some affected areas, police action is necessary to build roads, schools or other facilities," Chidambaram said. The Home Minister said that the Centre had given Rs 25 crore each to the 60 Maoist-affected districts under the integrated action plan last year and Rs 30 crore each to the select districts again this year. 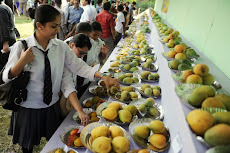 UNI, Agartala, 25 April : To manage the financial crisis Tripura government has enhanced the Value Added Tax (VAT) schedules that would lead to price hike of all essential commodities, including fuel. However, the Opposition has demanded to roll back the decision. 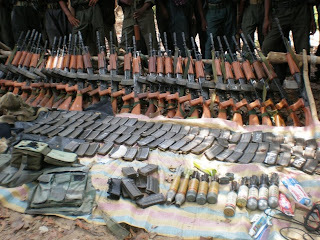 UNB, Cox's Bazar, 25 April : Ten robbers were killed in gunfights with police and mob beating in Cox's Bazar today. 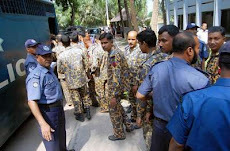 A villager was also killed in the exchange of fire between the gang and the police that left at least 21 others including four policemen bullet-hit. The robbers carrying guns and sharp weapons also attacked villagers who chased them. The series of incidents started at Ratnapalong village in Ukhia upazila around 2:30am (BDST) as a gang of 23 dacoits looted valuables from four houses, police said. 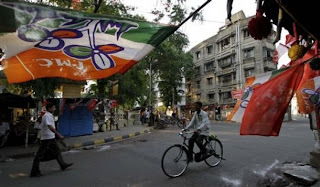 PTI, Kolkata, 25 April : West Bengal Inc wants politics to be kept out of business by the new government that will be decided in the ongoing Assembly polls in West Bengal as they believe the prosperity of the state has taken a beating on account of political differences and issues. "The administration should exercise control so that business can function without any influence by political parties. Development should be on merit and free from political considerations," Bengal Chamber of Commerce and Industry (BCCI) Director General P Roy told PTI. A similar view was expressed by Indian Chamber of Commerce President Jayanta Roy. "It is advisable for ruling and Opposition parties to continue to have dialogue and resolve differences through discussions. If the conflict between the ruling and Opposition party continues, the state is going to suffer in future also," he said. 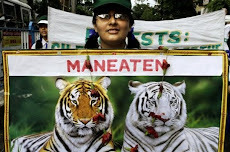 Jalpaiguri, 25 April : Two persons were injured today after leopards attacked them in a betel vine here, while six others were hurt while trying to catch the felines in Jalpaiguri district, a senior forest official said. 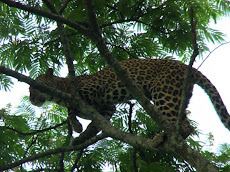 Ashu Bhadra and Sandhya Das were injured when the leopards attacked them at Paschim Jhar Beltali village this morning, Divisional Forest Officer Omprakash said. Later, four forest guards were injured after they fell into a ditch while chasing the leopards, while two others suffered tranquiliser shots that mistakenly hit them, he said. All the injured were admitted to hospital. 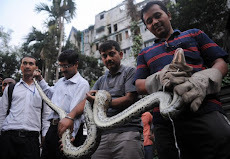 Efforts were on to net the animals, he said. PTI, Nagaon (Assam), 25 April : The pro-talk ULFA faction today held a meeting to discuss the direction that the peace process should take and their stand against the anti-talk faction. 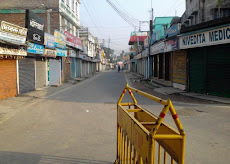 The meeting was held at Khalai Gaon near Jajari in central Assam's Nagaon district under the leadership of its chairman Arabinda Rajkhowa, said sources close to the underground faction without divulging further details of the meeting. Besides Rajkhowa, ULFA vice president Pradip Gogoi, deputy C-in-C Raju Baruah, 'finance secretary' Chitraban Hazarika, 'cultural secretary' Pranati Deka and other leaders were present in the meeting, the sources said.